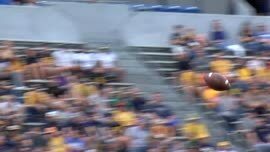 David Sills has 60 catches for 980 yards and 18 touchdowns for West Virginia this season. 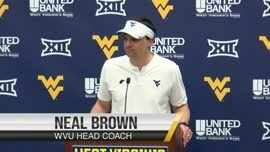 MORGANTOWN, W.Va. — FBS touchdown reception leader David Sills became West Virginia’s lone first-team representative on the All-Big 12 team announced Thursday. With 18 touchdowns this season, nearly one-third of Sill’s 60 catches went for scores. He stands 20 yards shy of a 1,000-yard season entering the Mountaineers’ bowl game and is a Biletnikoff Award finalist. 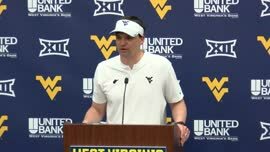 West Virginia quarterback Will Grier was named Big 12 offensive newcomer of the year after throwing for 3,490 yards and 34 touchdowns in 11 games. Grier’s regular season ended Nov. 18 against Texas with a broken finger on his throwing hand. His surgical recovery timetable of four-to-six weeks makes his return for a bowl game unlikely and Grier faces a decision on whether to enter the NFL draft. 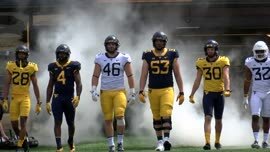 Among the second-team selections for West Virginia were receiver Gary Jennings, running back Justin Crawford, offensive tackle Yodny Cajuste, safety Kyzir White and kick returner Marcus Simms. Oklahoma quarterback Baker Mayfield was chosen Big 12 offensive player of the year, while Sooners defensive end Ogbonnia Okoronkwo and Texas linebacker Malik Jefferson shared top defensive honors. Oklahoma’s Orlando Brown won top offensive lineman and Texas nose tackle Poona Ford was chosen the Big 12’s best defensive lineman. Iowa State’s Matt Campbell earned coach of the year honors after the Cyclones won seven regular-season games for the first time since 2005.